New York's school-district libraries were a forerunner of the free public library. A law passed by New York's state legislature in 1835 authorized the creation of libraries in school districts which were intended to serve the general population and not just school pupils. Education reformer James S. Wadsworth (1768-1844) is considered to be the father of New York's school-district libraries. The initial law enabled school districts to tax themselves $20 the first year and $10 in succeeding years for the purpose of creating a library. New York revised its law in 1838 to provide a greater incentive for school districts to create libraries. I recently acquired a very interesting letter (see above) related to school-district libraries in New York. 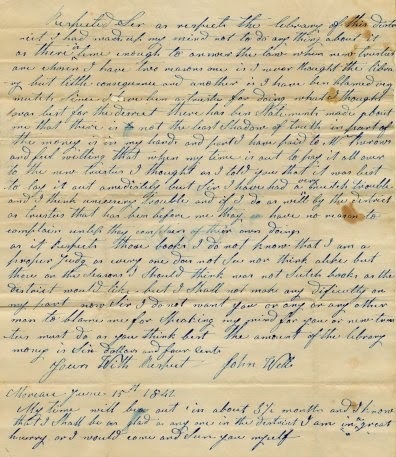 The letter was written on June 15, 1842 by a school-district library trustee for Moreau, NY complaining about his treatment on the library board. The trustee writes: "As respects the library of this district, I had made up my mind not to do anything about it, as there is time enough to answer the law when new trustees are chosen. I have two reasons: one is I never thought the library but little consequence, and another is I have been blamed very much since I have been a trustee, for doing what I thought was best for the district." He ends with: "My time will be out in about 5 1/2 months and I know that I shall be as glad as anyone in the district." New York was the first of a number of states to create school-district libraries. Design Your Own Gleeson Button WINNERS!! 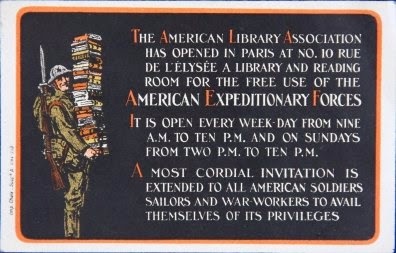 Before the American Library in Paris was founded in 1920 it served as the central library for the American Library Association's Library War Service for France during World War I. I recently added an advertising card (see above) promoting the opening of ALA's library in Paris to my collection of librariana. 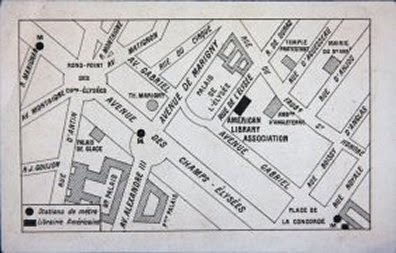 The card has a map on the back showing the location of the library. The ALA library opened in July, 1918 and was located in the former residence of the Papal Nuncio to the French Republic at No. 10 rue de l'Elysee. Burton Stevenson head of the Library War Service in Europe later said, "I dare say no public library was ever before installed amid such glittering surroundings." I was really pleased to get the card because it will go well in a philatelic exhibit I'm putting together for the stamp show in Denver, CO which takes place in May. The exhibit is titled appropriately "The American Library Association and World War I" and consists of sixteen 8 1/2 by 11 inch pages on which a variety of philatelic and other paper artifacts are mounted. I've written blog posts about many of the items in the exhibit which can be found HERE. Another post about the American Library in Paris can be found HERE. Arthur P. Young's Books for Sammies, The American Library Association and World War I (Beta Phi Mu, 1981) was a source for some of the information in this post.